More Adventure. More Tech. More Value. Built Ford Tough® with modern-day styling inside and out. Under the hood is a turbocharged 2.3-liter four-cylinder that delivers 270 horsepower and 310 lb-ft of torque. * Yet, with all that muscle, the Ranger is the most fuel-efficient gas-powered midsize pickup in America. ** A ten-speed automatic transmission and electronically-locking rear differentials locks the axle completely at both wheels simultaneously, delivering the traction you need when you need it the most. 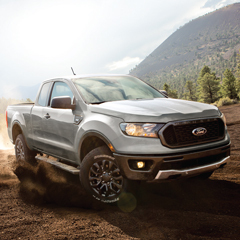 With its high-strength steel frame, steel frame-mounted bumpers, off-road chassis components and EcoBoost® power, every Ranger is bred for adventure. And for the serious all-terrain enthusiast, there’s the Ranger outfitted with all the must-have features in the FX4 Off-Road Package. Shifting into four-wheel drive is as easy as turning a dial with the electronic shift-on-the-fly (ESOF) system. The Terrain Management System™ (included in the FX4 Off-Road Package) has four selectable drive modes: Normal, Grass, Gravel/Snow, Mud/Ruts, or Sand to provide the optimum traction, driveability and performance. 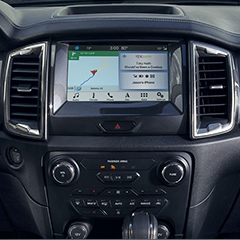 From the driver-assist features in Ford Co-Pilot 360™, to voiceactivated SYNC® 3 and FordPass Connect™ The Ranger brings confidence and enjoyment to the driving experience. With a torque rating of 310 lb.-ft.** Ford Ranger beats all other gas-powered pickups in its class. And considering all that torque it’s surprising the Ranger is also the most fuel-efficient gas-powered midsize pickup in America. * Need to haul and tow? Ranger wins here too with best-in-class max. 1,860-lb. payload and 7,500-lb. tow*** ratings. Four selectable drive modes: Normal, Grass, Gravel/Snow, Mud/Ruts, or Sand provide and added level of control on or off the road. The system, shifting on the fly, automatically calibrates engine responsiveness, transmission gearing and vehicle control systems to provide the optimum traction and performance. Ford Co-Pilot 360™ comes standard on Ranger XLT and LARIAT and is optional on Ranger XL. Enhanced voice-activated communications and entertainment capabilities of available SYNC® 3 start an 8” capacitive center stack touchscreen. The sleek user-friendly interface helps you connect to and control your smartphone. Enjoy pinch-to-zoom capability with the available voice-activated Navigation System. Two smart-charging USB ports are included. SYNC® 3 also brings you the power of Apple CarPlay™ and Android Auto™ compatibility to your Ranger. 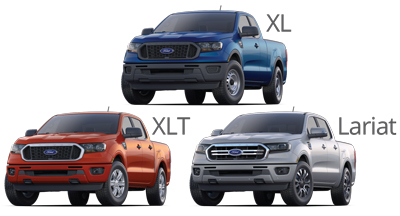 Available in three distinct series (XL, XLT, and Lariat), two cab configurations (SuperCab and SuperCrew®), two box sizes (5ft and 6 ft) and eight exterior colors means there’s a Ranger that’s right for you. 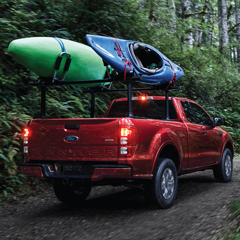 The all-new 2019 Ford Ranger has the best-in-class gas torque* and the most fuel efficient gas-powered midsize pickup in America. ** Need to haul more? Tow more? The new Ford Ranger has these big advantages over other gas-powered midsize pickups: best-in-class maximum 1,860-lb. payload* and 7,500- lb. tow*** ratings. *Class is Midsize Pickups based on Ford segmentation. **EPA-estimated ratings: 21 mpg city/26 mpg hwy/23 mpg combined, 2.3L engine, 4x2. Actual mileage will vary. Class is Mid-Size Pickups based on Ford segmentation. *** When properly equipped with the trailer tow package and a trailer brake controller. Ask a Sales Representative for complete details. All illustrations and specifications are to the best of our knowledge correct as of the date of publication. They are subject to changes made by the manufacturer and the laws or regulations of any federal, state or local government agency. Overseas Military Sales Corporation is an authorized contractor of the Exchange and NEXCOM. Military AutoSource is an authorized distributor to sell and distribute Ford vehicles. This advertisement does not express or imply endorsement by the Exchange, NEXCOM, DOD components, or the Federal Government and is not sponsored by them.